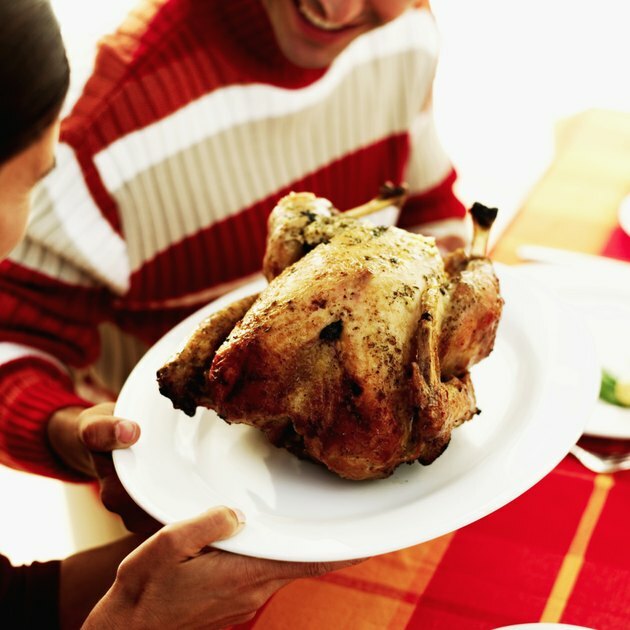 A fan-assisted oven, otherwise known as a convection oven, roasts a turkey with moist meat and crisp skin in less time than a conventional oven. Convection ovens circulate the heat with fans to more evenly and efficiently cook food. When using a convection oven, expect your turkey to roast in about 3/4 of the time it would take in a conventional oven, notes Epicurious. Typically, you cook at a lower temperature in a convection oven, but a whole turkey is sturdy enough for a standard cooking temperature and the high heat helps crisp the skin. Set your fan-assisted oven to the convection roast setting rather than the convection bake setting, if such an option exists on your model. Preheat to 325 degrees Fahrenheit. Reach into the turkey's cavity and pull out the neck and giblets. Wash off the entire exterior and interior of the turkey with cold running water and pat it dry with paper towels. Set the turkey onto the rack of your roasting pan with the breast facing up. Use a shallow pan, optimally no more than 2.5 inches deep, as deeper pans obstruct the fan-blown air of a convection oven from getting to the bottom of the bird. Locate the excess skin in the turkey's tail area. Pull it up gently and tuck the ends of the turkey's legs under it. Release the skin to hold the legs in place. Locate the excess skin at the turkey's shoulders. Lift it up gently, angle the turkey's wings toward it, and insert the tips of the wings under the skin. Release the skin and it will secure the wings in place, and be held taut during cooking. Brush the skin of the turkey with a light coating of melted unsalted butter, if you like. Add any other desired seasonings to taste or as per the instructions of a favorite recipe. Insert an oven-safe meat thermometer into the middle of one of the turkey's thigh muscles. Pour 2 cups water or vegetable or chicken stock into the roasting pan to moisturize the bird as it roasts. Use more liquid when cooking in a fan-assisted oven than you would use in a conventional oven as it evaporates faster. Refill the liquid as needed during the roasting period. Roast the turkey in the convection oven until the temperature reading in its thigh is 165 degrees Fahrenheit. Expect a medium-sized turkey of 12 lbs. to require two to two and a half hours of cooking time. Rely only on the thermometer, though, for indication of a fully cooked bird, as cooking time varies too widely by oven and a variety of other factors to be a reliable measure. Rest the turkey for at least 15 minutes after removing it from a fan-assisted oven before slicing and serving it. Thaw a frozen turkey by refrigerating it for 24 hours per every 4 lbs. of weight, recommends the United States Department of Agriculture. Avoid basting the turkey more than once or twice near the end of its cooking time. Contrary to popular belief, basting doesn't make the meat any more moist, but it does help brown the skin, explains the University of Illinois Extension. However, opening the door of a fan-assisted oven releases heat, meaning that basting impedes cooking.